Tandikat Volcano is a stratovolcano also known as Tandikai, Tandike. 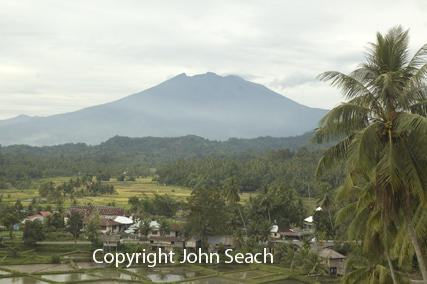 The volcano is located in the Padang Highlands, West Sumatra, about 7.5 km from Padangpanjang. It is joined to a larger mountain called Singgalang. There are two summit craters, one with a lake. Crater A is 1200 m in diameter and covered with dense vegetation. Crater B is 400 m in diameter. Crater A has produced 24 lava flows and 4 pyroclastic flows, whereas B crater produced one lava flow. A waterfall called Lembah Anai is a tourist attraction. Residents felt an earthquake near Tandikat volcano on 20th January 2003. A significant number of volcanic earthquakes were measured at the volcano. During the week of 20-26 January 2003, 149 deep volcanic earthquakes were recorded, and 174 tectonic earthquakes. The alert level was raised to 2 (on a scale of 1-4) on 25 January 2003. No eruptions occurred.